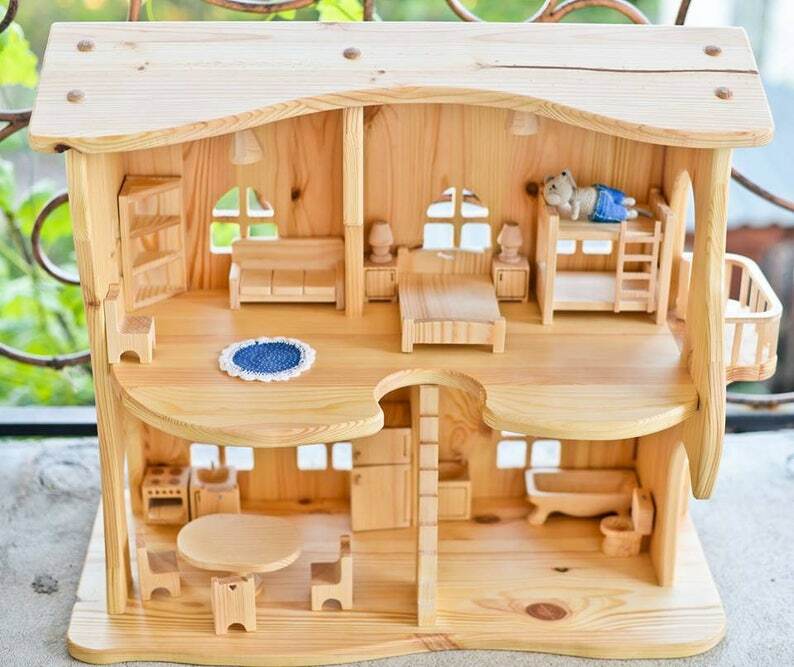 Dollhouses continue to be an enchanting and popular toy valued by both children and adults. Little homes filled with furniture and dolls have been around for thousands of years. It is not just the acting out scenes that delight children; it is also rearranging the dollhouse furniture in such a way that it pleases their personal tastes and also allows them to create the scenarios they want. This two-story Wooden dollhouse *Without furniture*is 100% handmade. It is a great gift for your child, is eco-Friendly, Unique, hand Crafted, safe for children. House lighted of AA batteries - as it works on 4 diodes lamps, it doesn't get hot, safe to touch. Height 60cm 23,6in , length 70cm 27,5in, depth 30cm 11,8in . As you know, a wax is a safe product for children so they won't get poison or allergy. Amazing quality and detail! I'm very pleased with the dollhouse! This is so lovely! What a great, imaginative house, ready to be filled with hours of play. This came in perfect condition to Florida, very cleverly wrapped for the long trip. This is truly an heirloom toy. I can't wait for my granddaughters to open this on Christmas. Thank you so much for making this beautiful dollhouse. Thank you. There was no problem and all worked out fine with the delivery. The product is great!